the TL;DR of this is that I purchased subs. They were carded. 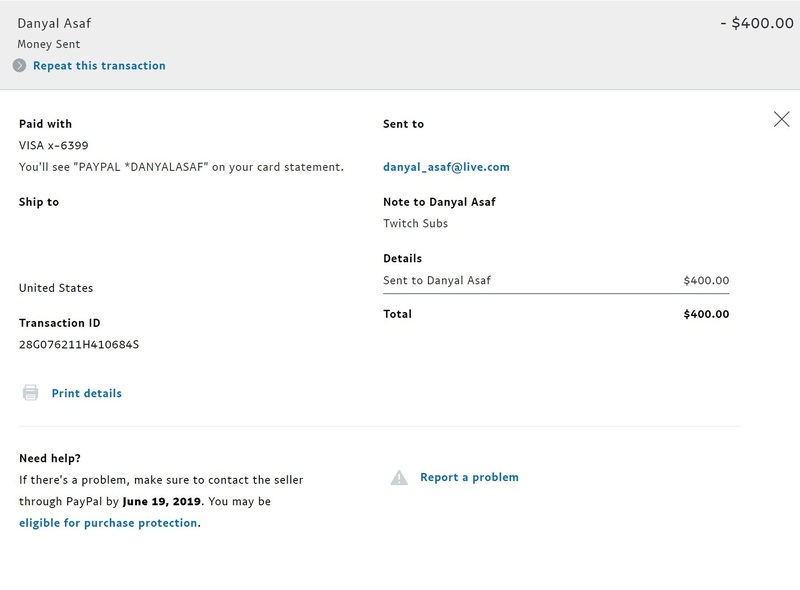 Chargebacks began that eventually led into the account being permanently banned. For a background of the account. Active streamer with real views and 20+ hours logged per week. I've reached out to him only to have him go mia on me. didnt bother to unblur the account name since its permanently banned now aways and you can't even log in to see any stats. Any other information needed feel free to post and I will do the best of my ability to provide it. I am willing to talk about this dispute. Can you please tell me how much amount you bought and you pushed me to deliever all at once. 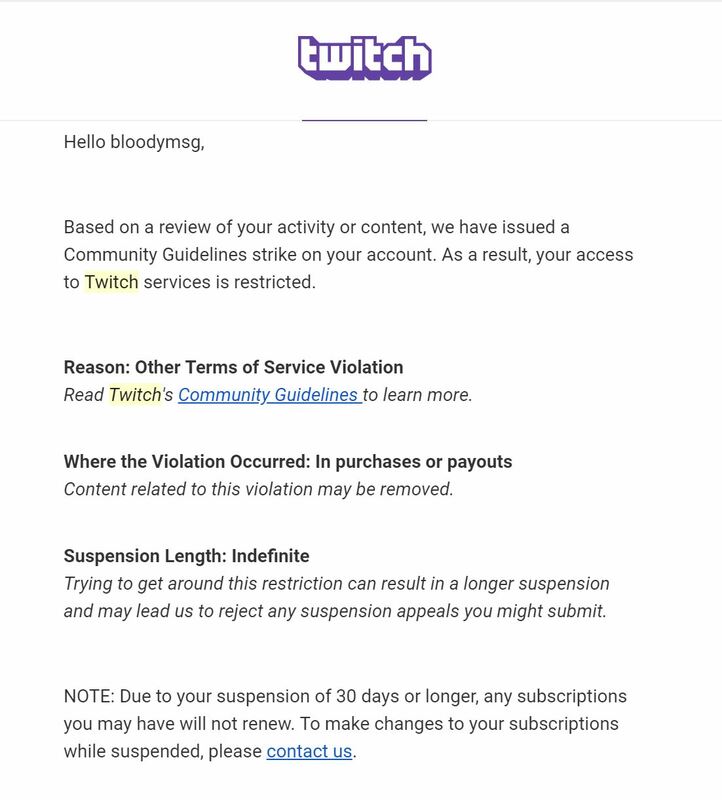 You twitch account was not able to handle that much. I waited for you to contact me on discord so we could talk more. I purchased 140 subs for $400. Though I'm sure you did this being aware of the twitch payment cycles needing to be done by the end of the month. Should more proof be needed I can supply additional screenshots of the Trade Guardian thread between us. @purpl3haze9 Around that time i had many customers and i didnt see complains and they thanked me for the payouts. I do understand that you had issue but there was something not done right from the account that it had issue the service was delivered and also yes i remember the trade guardian and yes it was asked many times at the end that you want it delievered and i had limited time to deliever. So i remember lot fo them were done in that time period just to meet up my order. But if thats being done you have to make sure that your account is capable of holding that any subs. i m sure you are complaining after listen to some guys which have nothing to do with the service and they have other personal issues with me. But i assure you that service was done like everyone else and the ones got payouts. Follower/viewers/chatters/stream hours they all matters hence why i do those services now and if you are in my discord i constantly post them as recommended services. like i said ton of people got the payouts in Jan and previous months as well and will get in the next month as well. But there was something not suitable in your account to hold that much in that time frame. i am not sure of that unless i can login to that account and see the stats average but you wont be able to provide that since its banned. I m here friend if i was a scammer i would have ran off. @purpl3haze9 it also was not the chargeback or the subs which you misunderstood i dont do that service. Please avoid the trash talk from the competitors or haters and come to me to talk about it and i will talk to you honestly. @purpl3haze9 i would also request that you take your negative review back or make it netural since the service was delievered as promised but if that makes you happy or feel better then sure you can still keep it up. I'm complaining because your service got me banned. The subs you provided did not remain and were clearly carded. They slowly got chargebacked as the owners of the CC's you used saw the mysterious transaction and called their providers for a chargeback. From there the amount is deducted from my account on twitch which raised the red flag. I can even provide an additional screenshot for this where it clearly says the reason my account is banned is "certain transactions associated with the revenue violate our terms and policies. " Your response to this was my account couldn't handle the subs, but i'm sure if a consensus is taken by other sub buyers on this forum of their streaming stats fall far below mine. I'm not changing the feedback I left. I stand by what I wrote and my experience and with you it certainly hasn't been a pleasant one and would prefer that others known what is at risk when dealing with your services. That is all I have left to say and will leave this up to whichever higher authority on this forum looks at this thread and decide/request additional information from me. As i said my service is not carded service please dont judge like that. Also i said before the other clients of mine got their pay checks and that was the total same way and been like this over a year and half. If it happened to you there was a reason and i m willing to investigate with you but i need to login to your account. No refund will be provided to as what the service was done! And trade guardian checked as well. What happened after that i dont know... you might have done more to account then that. I will say once again that people who did same as you in that time period got their chashed out checks. You might still get your payout but down the line as well. Also you can get your account back by appeal. If it happened there must be a reason and i explained above in much detail i could. Thats all i have to say but wish you luck as well. I am done here thank you. When did the account get banned? Also, was it banned or suspended? @ITALY Really great point and description but i would like to mention that there are involvement then that from twitch side. Follower/viewers/channelviews/chatters and subs in certain time they are held accountable and i hope you understand that as well if you do understand service. But i assure you it was not fake CCs that would be very bad and dumb service to do so plus if that was it i m sure ton of people could do this easily am i wrong? Also i would mention it was not instantly banned like i said the person got banned long after the service so there was alot more then that involved hence why i wanted to login and help out which i usually dont do but i was willing to but since its banned i wont be able to do so. If you are giving proof from your side? i have proof of my customers cashing out as well if you like i can ask them to vouch here too as well. Maybe that will ring some green bells. Also btw you can still get account back but you will have to appeal for it (its google doc appeal) - You can pay me for that service too. @ITALY Also please avoid your experience and what you got or not, Every individual/streamer is unique and his account is unique with the understanding of that i can assure you what you had is different from what the buyer had. You know i wont do that just because its my business and for it to be unique but its not you i get requests every other day for it and I apologize for that. Any other way available? If you cant describe your method we will have to rule in @purpl3haze9 's favor. @EpicNPC CM i guess i will share my method with you gladly! dont care anymore if it gets out anyway! @EpicNPC CM done sir sent! DannyX, you owe a 100% refund. @EpicNPC i believe again out of context. please read the messages above. @purpl3haze9 please confirm if you have received a full refund from @Dannyx. Ban at the end of the day if refund is not issued. @EpicNPC explained in the DM already rest is yours to handle. Dannyx has refused to issue a refund. purpl3haze9 you'll have to open a dispute on Paypal if you haven't already. Good luck.